Ferbettes: That's what my baby says! Ferbettes: And my heart starts pumping! All: Gitchee, Gitchee, Goo means that I love you! Whenever she says something sweet. Phineas: Sometimes I wish she'd give it to me straight! Phineas: When I take the time to translate! All: Heres what Im talkin' 'bout! Phineas: Well I don't know what to do! Ferbettes: I don't know what to do. Phineas: But I think I'm getting through! Ferbettes: I think I'm getting through. Ferbettes: When I say I love you! Phineas: She's says, "I Gitchee, Gitchee, Goo you too!" Ferbettes: Gitchee, Gitchee, Goo you too! 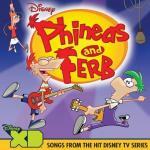 Phineas: Gitchee, Gitchee, Goo you too! Phineas: Dont need a dictionary! Candace/Ferbettes: That's what my baby says! Candace/Ferbettes: And my heart starts pumping! Phineas: I said, a-Bow, Chicka, Bow-Wow! Candace/Ferbettes: Thats what my baby says! Gitchee, Gitchee, Goo means that I love you! That I love you baby, baby, baby!